This site reports continuing progress in the emerging interdisciplinary science of Geoecodynamics. I aim to collate summaries of relevant discoveries as these appear, including scientific papers and related data and ideas. My overarching aim seeks to refine the central concepts and theories of this emerging field. Geoecodynamics was formally named and defined by Cotterill and de Wit (2011 S. Afr J. Geol.). This review brought together several concepts and theories from the earth and life sciences into a synthetic theory to define the scope of Geoecodynamics, and outline its fascinating research potential across geobiology and earth system science. In short, the opening up and opening out of the genomic record enables the geobiologist to study biodiversity dynamics as an earth surface process. Our integration of this theoretical platform focused on the Cenozoic landscape evolution of central Africa’s Kalahari Plateau. This study area comprises a vast wetland archipelago, and it is ideal to demonstrate how we can use selected species of vertebrates as biotic indicators of landscape evolution. We can study these stenotopic species as biotic indicators of landscape evolution. Evolutionary histories of individual species have been shaped by their fidelity to wetland habitats; landscape topography including that the actual wetlands has controlled biogeographical processes. These influences of landform control by the wetland archipelago on the dispersal of individual species include terrestrial biota restricted by riparian barriers. The individuated geobiotic histories of biotic indicators across the Kalahari Plateau reflect the timings and places of formative events in palaeo-drainage evolution of central Africa since the Oligocene. Patterns in DNA variation can be studied using the tools of phylogeography and phylogenetic systematics. Molecular clocks calibrate events interpreted as demographic responses of biotic indicators to palaeoenvironmental events. Our ability to read these historical signatures in genomic record of extant biodiversity can be applied to resolve ages, tenures and affinities of individual landforms, and collations of these data can be applied to reconstruct narratives of landscape dynamics. can obtain consilient resolution compiled from differences and congruence in the species-specific patterns of DNA variation. Ultimately, geoecodynamics can exploit consilience in suites of biotic indicator species to test competing theories of geospheric dynamics, where we are able to read the geobiotic evidence in evolving landscapes. In the case of the Kalahari Epeirogeny, the tempo and mode of tectonics is the pertinent example. 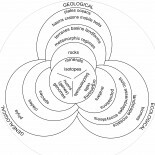 The inaugural review in 2011 concentrated on defining the core concepts and rationale of the emerging science of Geoecodynamics, using the Kalahari Epeirogeny as the focal case study. So our 2011 paper only mentioned the few pioneering studies then known to us. Among several aims, this blog will single out these inaugural studies in deserving detail, and I will continue to report new examples and ideas, and advances emerging across the frontiers of geobiology.